It may not look like much, but this is a wonderful salad made with our own local lacinato kale, which is sometimes called dinosaur kale because of its wrinkled leaves. The recipe is simple. 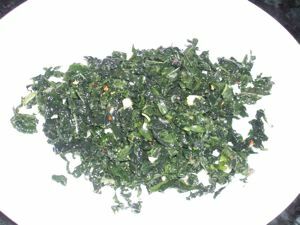 Take a bunch of lacinato kale, clean it, remove the stalks, roll it up and cut it into thin strips, perhaps a 1/4 or 1/3 of an inch across. Toss it with a couple of cloves worth of minced garlic, a teaspoon of dried red pepper flakes, a tablespoon of olive oil and lots of lemon. Some lemons are juicier than others, so sometimes a half a lemon will do it, but sometimes we'll need as whole lemon's worth. It's a light, refreshing salad, and real taste of the North Olympic Peninsula. The road to Whiskey Bend was closed after the last wind storm, but it has been open for a while now. The road is its usual winding, one and a half lane, unpaved self, and the trail is quite passable, at least the first few miles. 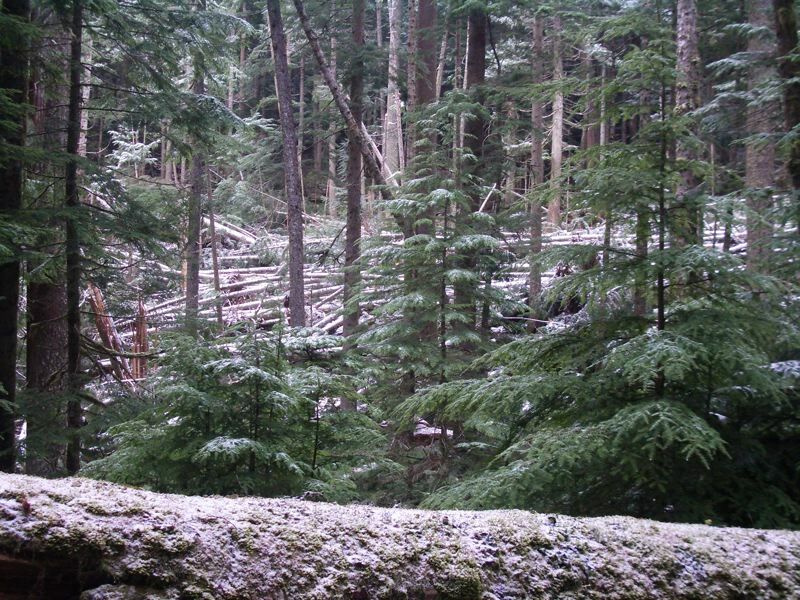 The Elwha Valley doesn't bear the full brunt of our winter storms, nor does it get all that much snow. Even when there is snow on the peaks on either side of the valley, the road and trails are snow free. The foliage thins out in the colder months, so the views are better than ever. There isn't much beach, but what there is is choice. 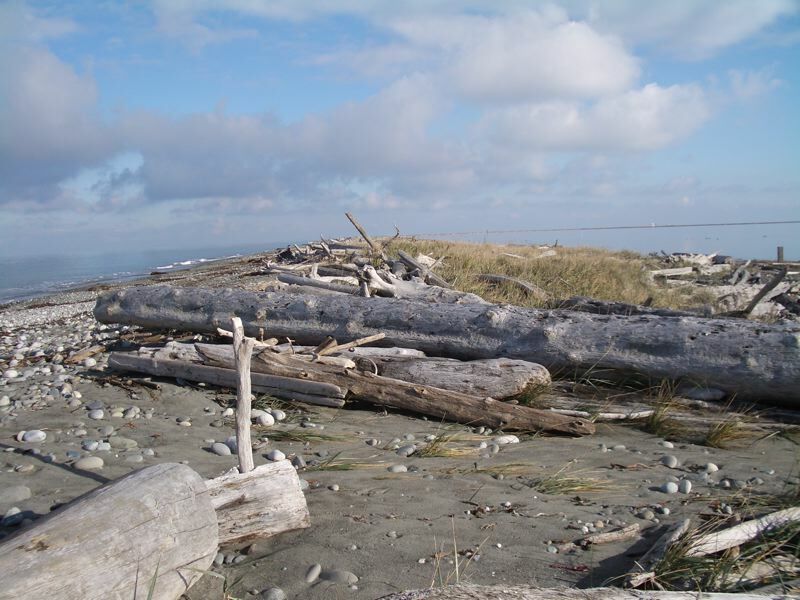 There aren't any good high tides for hiking the Dungeness Spit until January, but the spit is still passable, even at fairly high tides (e.g. 8 feet or so). The going is rocky, with lots of rounded stones, and that makes it more tiring. Still, there is the strait, the islands and the sky, not to mention the wonderful mountain views. We did make it a bit farther along the Lake Angeles Trail. 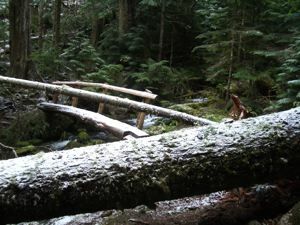 We made it across the bridge and perhaps another few hundred feet before the brush and fallen logs stopped us. More intrepid hikers continued, but you can see what the trail looked like on the right. 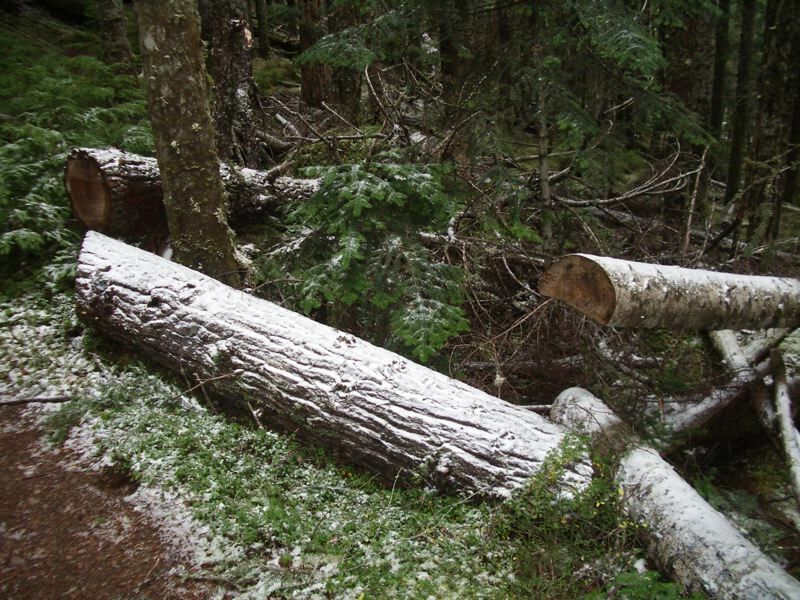 The Lake Angeles Trail is open, but there are lots of logs down thanks to last week's wind storm. The park service has cut some of the logs near the start of the trail, but clearing the trail is still low priority with so many roads out. Still, we managed to get up to the little river crossing about 700 feet above the parking lot, or around 2600 feet above sea level. We considered going farther, but as you can see in the picture to the left, there was a big log down right before the bridge. (That log is about three feet in diameter). That probably wouldn't have stopped us. There was a good crawl space under the log, but the bridge was covered with snow, and we didn't have our Yak Trax. 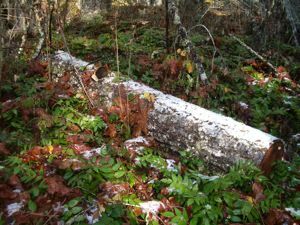 There wasn't any snow at the trailhead, but about 300 feet up we saw our first signs of winter, a light frosting alongside the trail. The trail itself was largely clear, but there was more snow as we ascended. Now and then we could see a thin layer of snow had settled on the canopy of the forest, which is partly why there was so little snow on the ground. 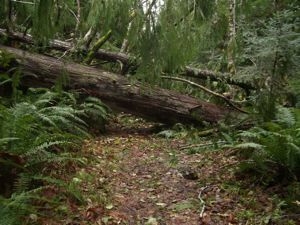 There were a few downed trees blocking the trail, but most could be stepped over or walked around. 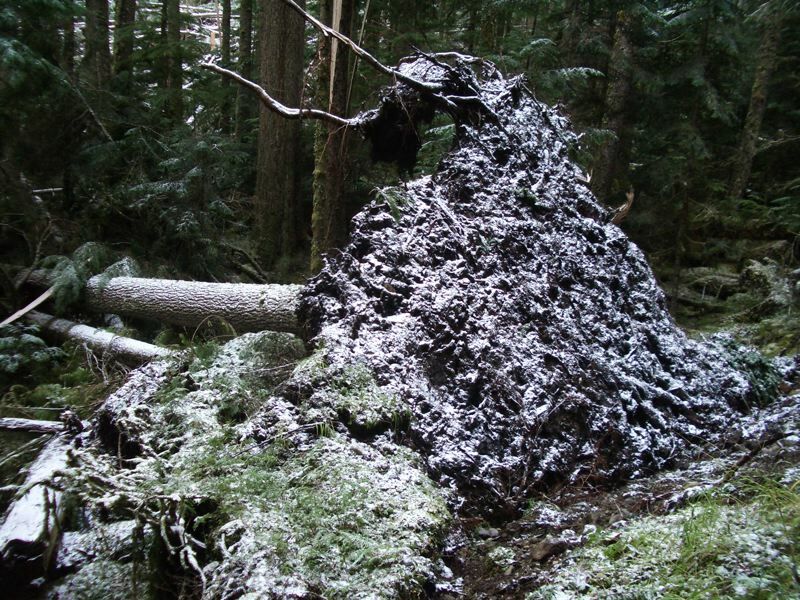 There was one spectacular root mass that had pulled out when a tree right next to the trail had fallen downslope. All told, signs of wind and signs of winter. 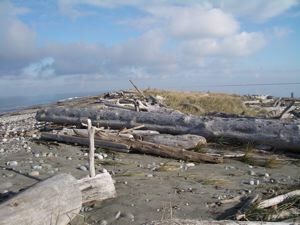 There was a big windstorm last week. We were lucky and got by with a fifteen minute power outage followed by a six hour DSL outage. West of Port Angeles power was out for days, and even some people in town had to wait days for the lights to come back on. The PUD, and the town electrical people, were running ragged. Trees were down all over the place, and the roads were a mess. Even now, the park is still digging out. 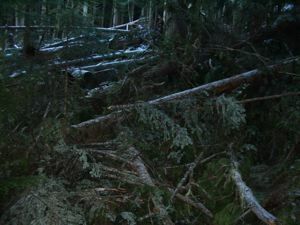 Hurricane Ridge Road is still closed, largely due to downed trees. 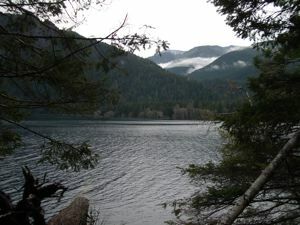 We decided to take one of the more accessible trails at Lake Crescent, so we set out for the Spruce Railroad Trail along the north side of the lake. We didn't get far before our first obstacle. 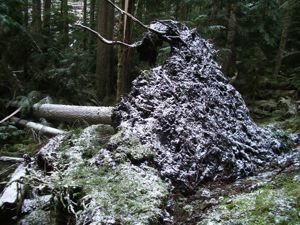 There was a big tree with lots of branches down across the trail (see the photo below). This did not bode well. We figured that we'd be clambering under and over tree trunks the entire walk, but we figured wrong. 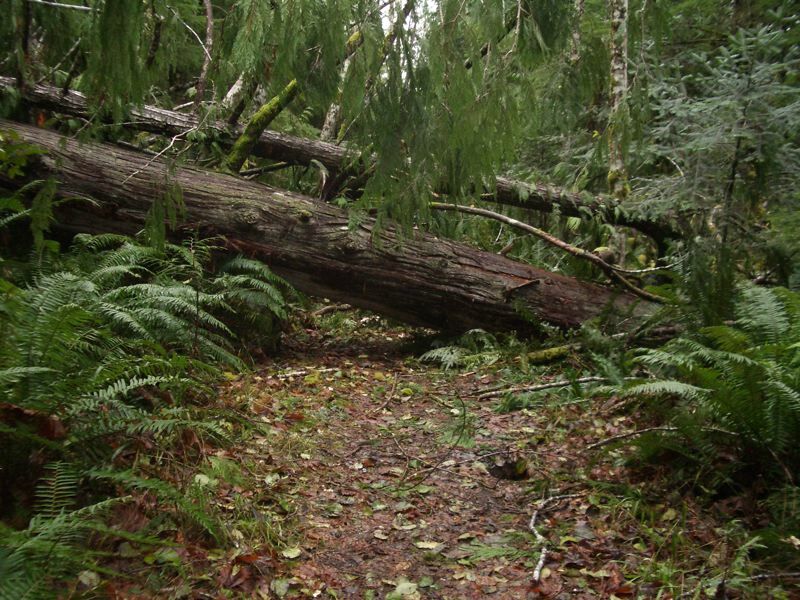 We actually made it three miles down the trail, to the "point", as we call it, and there were four, maybe five, trees down across the trail in all. For our efforts, we were rewarded with the silvery lake, and some fantastic views of the mountains to the south. 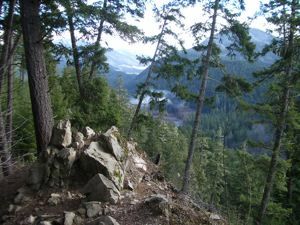 You can see the river clouds hanging over the Barnes Creek Valley in the photo to the right. There was a touch of snow on Storm King, but no solid snow line. There were lots of downed branches, and that gave us a wonderful opportunity. 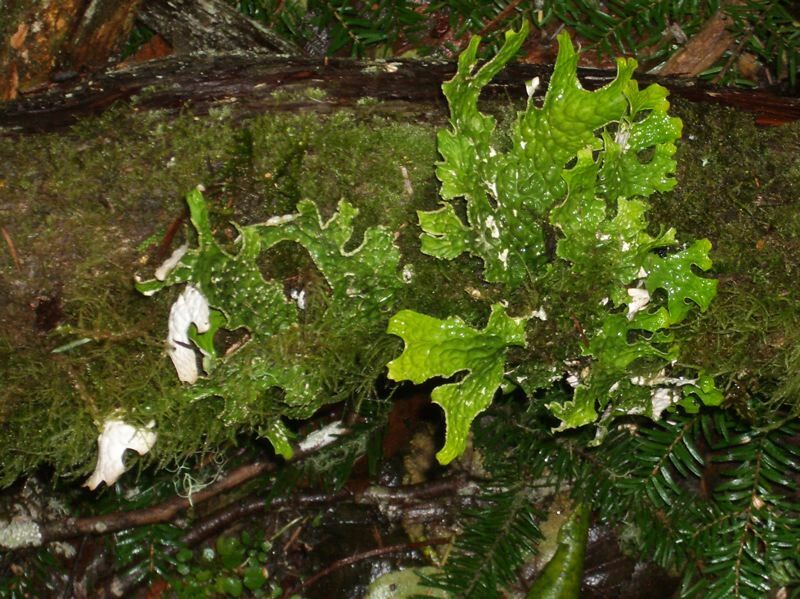 Rain forest trees, especially the big old maples, are covered with lichens, moss, Spanish moss, little ferns and the like, but these can be hard to see except rather low on the tree. There's just an overall impression of life and green-ness. With all the branches down, we got a better view. Below and to the right, there's a photo of a rather common lichen. It looks like a bunch of leaves, but the back is white. The algae get the sunny side and the funghi get the shady side, and they do very nicely together. We were exploring the new Seattle Art Museum sculpture garden and were suprised to find a taste of home. Inside the concrete building down on the corner of Broad and Eliot was a nurse log. Since this was the middle of the city, they had the nurse log on life support with all sorts of humidifiers and temperature controls. Most of the nurse logs we see tend to manage on their own, but downtown, they need a bit of help. 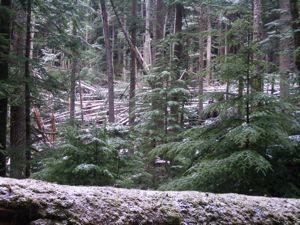 According to the docent, the original tree fell in the Tacoma area and was collected, along with lots of mosses and little undergrowth plants, to comprise the Neukom Nurselog exhibit. They did a nice job, though we aren't sure of what the museum people are going to do when the young trees growing from the old log start getting tall. We'd like to think that they'll have a fund drive and grow the building. 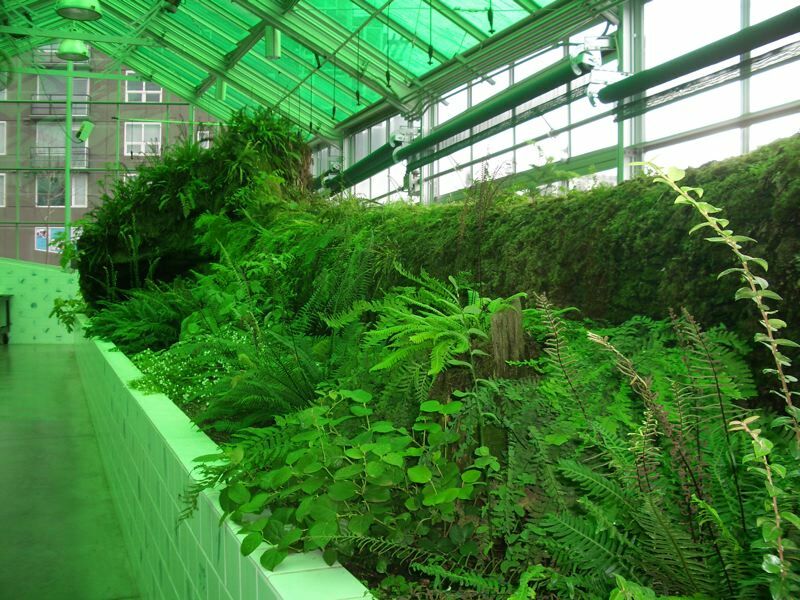 Why not a taste of artificial rain forest in downtown Seattle? This has been an unusual autumn, with an early snow and an early thaw. We thought we had said goodbye to the high country a while back, but we've just stumbled down from Klahane Ridge and must report that the high country is still open. The sky was gray and tinged with pink. The sun doesn't rise all that high this time of year. Still, the views were as spectacular as ever, with the Blue Glacier showing its color in the wintry light. 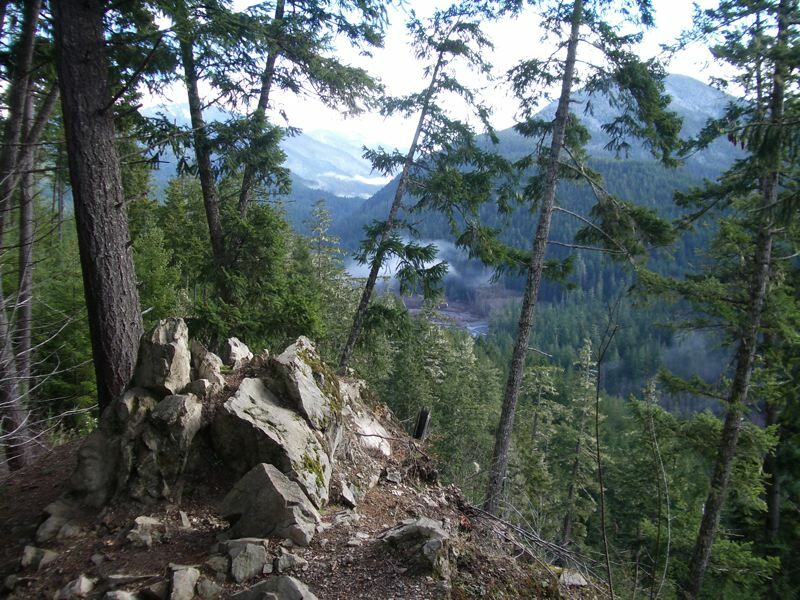 Here is a panorama of the view from Klahane Ridge, so you can see what we are talking about.